Emerging like its real-life counterpart after a misty, dewy spring morning, a colorful spectrum of works decorated the walls of the Clutter Gallery for the aptly titled They Came from Planet Rainbow Sparkles 2: Glitter In Your Eye. Comprised of works by fifty-two participating artists, each of whom was assigned one of the seven colors that constitute a rainbow, their resulting efforts were displayed in loosely defined sections that create a beautifully arranged, vibrant hue cycle. Amidst the cartoonish creatures of Chima Group, the fantastical oddities of Steve Ferrera, the whimsical amphibians of twelveDot, and works by other returning artists from last year’s They Came from Planet Rainbow Sparkles exhibition (learn more here), new inducties into the kaleidoscopic concept included Eimi Takano, Jay222, Kyle Kirwan, Seulgie, and the subject of this article’s focus, TOiNZ. Originally named Orange Star, this South Korean ceramic art toy collective was officially formed in 2010. 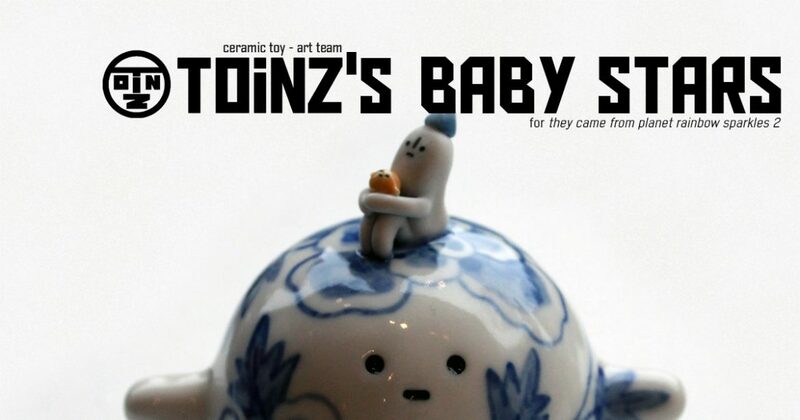 Comprised from the beginning of four members who had each studied pottery, TOiNZ consists of its “leader”, Sang-chul Lee (aka Sacha, formerly wiwi), as well as prototyper Yong-jae Lee (aka Yongpa), production manager Geun-hyang Kim (aka Jjoigom, formerly chiki), and marketing & accounting director Min-ji Kim (aka Gamnamu). Known for their fabulist works that manifest as either character-driven sculptures and functional but still artistic pottery pieces, though their brand of “friendly ceramics” has leaned more towards the former than the latter as the group’s progressed. And for their participation in the They Came from Planet Rainbow Sparkles 2: Glitter In Your Eye exhibition, the group’s blue themed works were displayed in the gallery’s main window, bookending a tiny army of What the Farmer‘s Bob creation in its Yellow Gold coloration. With each of TOiNZ’s four members contributing a uniquely handmade and hand-painted piece, they remained cohesive through employing the group’s unapologetically friendly, globular-shaped Baby Star character as the unifying base, a form the quartet have revisited frequently since its introduction as part of their second exhibition at Seoul’s EverydayMooonday gallery, SPACEWARD, in November of 2016. Delicately painted with a floral pattern reminiscent of traditional fine china, Sacha’s Baby Star piece culminates in a serene reposed rendition of Chuck, a cartoonishly simple humanoid character that has been a TOiNZ mainstay since its introduction in early 2016. And while the title of the work, Chuck on the Peony (or 모란위의 척), shows the significance of this tiny mascot’s appearance, of greater note is he clenches in his tiny hands, an unfathomly small Baby Star in a sun-like yellow hue. Conveying a sense of preciousness in his loving grasping of it, the relation between the larger rendition and the infinitesimal one speaks potential volumes about the true greatness that can be found in the smallest objects. Wearing a triangular hat on its triangular shape, the fairy-like village spirit character TEEYO resides atop a bed of sculpted blueberries and cookies on Jjoigom’s Baby Star depiction. A focal form in the TOiNZ oeuvre, TEEYO was introduced in mid-2014 but the overall aesthetic of this work harkens to Jjoigom’s personal preferences, specifically her penchant towards sweeter subject matters. Titled My Sweet Blueberry Star (or 나의 달콤한 블루베리 스타), this work’s decorative banding creates a connectivity between the two characters without overpowering the impact of the beautifully blue adornments. An expressionistic take rather than a paleoartic one, Yongpa’s Age of Tyrrano (or 티라노 시대) contribution is a Paleolithic pastoral featuring pop cultural depictions of a pterodactyl, two brontosauruses, an ankylosaurus, and a stegosaurus painted upon it. Topped by the wide-mouthed feline Tyrrano, a character the group debuted in mid-2016, its appearance is akin to that of a king residing over that he controls, which in this instance appears to be an idyllic land filled with smiling faces. The final of the four contributions by a TOiNZ member, Gamnamu’s Blue Ruchi, bluish sea (or 푸른 루치, 푸른 바다) features a painted undersea landscape across its Baby Star base, variously sized fish swimming amidst swarms of jellyfish while a solitary crab reaches upward. Topping this hand-crafted ceramic work appears to be a small stone plateau, a gleefully happy literal fish out of water residing merrily atop it. And like all of TOiNZ’s works for this exhibition, this finely made piece of original ceramic art is a statement piece on its own, a glimpse into the singular voice from within this four-person collective. The They Came from Planet Rainbow Sparkles 2: Glitter In Your Eye group exhibition at Clutter Magazine Gallery had its opening reception on Saturday, September 8th from 6-9pm. All works in this exhibition will remain on display until October 5th, 2018 at the gallery’s physical location (163 Main Street, Beacon, NY 12508).